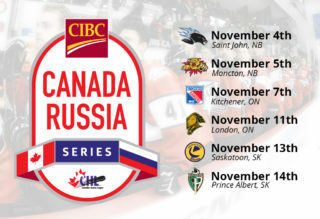 The 16th edition of the CIBC Canada Russia Series didn’t disappoint as Russia, despite losing the first game of the series against Team WHL, battled back to claim an 11-7 series victory in points following three consecutive wins in Games 4, 5 and 6. It marks Russia’s fourth series victory in the 16-year history of the event and the first time they’ve triumphed despite losing the series opener. The series was clinched on Dmitry Zavgorodniy’s (Rimouski Oceanic) late tying goal in Game 6 to force overtime before Saveliy Olshansky scored the game winner for Russia in Drummondville. The Russian series victory is their first since 2014. They’ve gone on to win one gold (2011), one bronze (2013) and one silver (2015) following past CIBC Canada Russia Series triumphs. Canada’s National Junior Team has gone on to win silver (2011) and gold (2015) in past years where the CHL has lost the series. Team Russia’s Stepan Starkov led the event in scoring, coming one point shy of tying a Russian event record with six points (1-5–6), registering at least one in five of the six games he played. Russian defenceman Saveliy Olshansky set a new event record for defencemen with five points (1-4–5) over six games. 54 players either signed or drafted by NHL clubs competed in the series from across the three CHL teams, including 13 first round selections. The Russian National Junior Team included 15 NHL draft picks, with one first rounder. The series is used as an evaluation for Canada’s National Junior Team that will compete in the 2019 IIHF World Junior Championship to be played in Vancouver, BC. The tournament will run from December 26 to January 5.